Did You Know That Investing In A Home Awning Can Actually Save You Money? A patio awning allows you to utilize your outdoor space more, saving you some money on those electricity bills! A window awning is one of the best ways to keep the sun from blaring in through the windows. If too much sun gets into your home, you are risking damage to your furniture, carpet, and flooring. The sun can actually lead your furnishings to fade over time, meaning you will have to replace them a lot sooner than you wanted to. In addition to this, the sun coming through your windows can contribute to as high as 20% of the work your air conditioning is doing. Reducing the amount of sun will reduce the amount you pay each month for those costly energy bills. A window awning comes in all sorts of designs to match the aesthetic you want for your home awning. Not only does a patio awning add a great look to your backyard, it allows you to utilize your outdoor space so much more. Being under the scorching hot sun isn’t really a relaxing experience, but if you are under an awning, you can be comfortable on your patio and still enjoy the weather. Patio awnings also keep the sun from coming into that part of your home, but it also just saves you money on electricity in general. 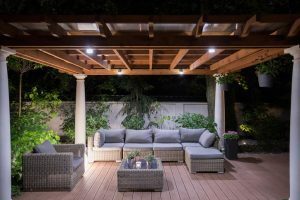 This is because you are sure to be outside more if you have a patio awning so you don’t have to use the lights and appliances in your home as much. While glass doors are very nice to look at, they let a lot of sun into your home. You can keep the classic look of a glass door and keep the sun out with a door awning. This provides a lot of the same benefits as a window awning does, while also keeping you comfortable when opening and closing your door. This home awning keeps the heat off of your door handle so that you don’t have to worry about burning your hand everytime you come in the house. It can also protect your front door from any damage that the weather can cause, increasing its lifespan.